The Sports Narrative! Now in Technicolor! - With Spring Training around the corner, Mr Feltman and Mr Copening talk baseball prospects, the Texas Rangers, A-Rod, etc. - Is Tiger done? We preview the upcoming gold season and maybe make a few friendly wagers as well. - Our final hour each week features a lovely segment known as the "Floater" in which one of us each week attempts to entertain the others. Mr Bowers leads off with the titular bit known as "The Narrative"
Each player has a different set of questions to answer. For some from smaller schools, it is proving they belong. For some, it is the medical exams. Others must answer questions off the field and still others what position will they play. Here is a look at some of the aspects of the Combine process and who is most under the microscope. 1. Jameis Winston, QB, Florida State – In order to secure the #1 overall pick, Winston must face the Bucs brass and answer their questions about the various off-field incidents in his 2 years at FSU. 2. Marcus Peters, CB, Washington – Peters, by the game tape, is the #1 CB in this draft class. But his game tape is limited from this year as he was dismissed from the Huskies program in November after 3 previous suspensions. 3. Dorial Green-Beckham, WR, Oklahoma – Green-Beckham never actually played for OU after leaving Mizzou after several arrests for drugs and assault allegations. 4. Frank Clark, DE, Michigan – Clark was dismissed from Michigan after misdemeanor domestic assault charges in November. Previously had a felony theft charge for swiping a laptop. 5. Paul Dawson, LB, TCU – Shooting up draft boards based on game tape, Dawson must answer to several rumors that he was a constant headache for the Frogs off the field. 1. Todd Gurley, RB, Georgia – Gurley is the best RB in the class by talent, but he can’t work out due to a late season ACL tear and has already torn the other knee’s ACL. 2. Randy Gregory, DE/OLB, Nebraska – Gregory’s long, lanky frame struggled with injuries throughout his time at Nebraska. While nothing incredibly serious, he will be under high scrutiny as he is a potential top 5 pick. 3. DeVante Parker, WR, Louisville – A broken left foot really hindered Parker this season and insuring his health in medical exams and in drills will be very important. 4. Ereck Flowers, OT, Miami – Flowers went down to knee surgery in October for the Canes. But he seems to have bounced back well and could vault back into the first round with a clean bill of health. 5. Owamagbe Odighizuwa, DE, UCLA – Odighizuwa missed all of 2013 having his hip resurfaced, an injury similar to the Rangers Colby Lewis. His long term health will be a question mark. 1. Amari Cooper, WR, Alabama – Cooper is easily the most polished and NFL-ready WR in this class. But a slower 40 time could cause some teams to look for sizzle over substance in either Kevin White or Parker. 2. Melvin Gordon, RB, Wisconsin – With Gurley not able to work out for teams, Gordon could be the first RB off the board, but will need a solid 40 time to keep the other runners at bay. 3. Shane Ray, OLB, Mizzou – With big questions about his pass rush repertoire past an incredible burst (see Dee Ford of Auburn from last year) Ray will need to wow with that burst to stay on top of a solid group of pass rushers. 4. Devin Funchess, WR/TE, Michigan – Funchess has the most to gain by running a fast 40, as he presents a matchup nightmare for defenses ala Gronkowski if he can add stretching the field to the skill set. 5. Devin Smith, WR, Ohio State – Smith proved he was more than just a “speed guy” at the Senior Bowl, but blazing a sub 4.4 could land him in round 1. 1. Shaq Thompson, LB/SS, Washington – Thompson faces some of the same question Panthers LB Thomas Davis faced coming out of college at Georgia. As a tweener, his best position may be in the eye of the beholder. 2. Brandon Schreff, G/T, Iowa – Schreff could fall into the “Zac Martin” class of an outstanding guard who could also play tackle. However, in the draft tackles always get drafted before guards so failure in tackle drills could have him slide. 3. Alvin “Bud” Dupree, DE/OLB, Kentucky – Dupree played all over the Wildcat defense, but his lack of size and lack of pass coverage experience could have him as a tweener guy. 4. Cameron Erving, C/G/T, Florida St – Erving played up and down the OL at FSU, but finished his time there at center. Position flex is a plus, but proving you have it is difficult in drills. 5. Eli Harold, OLB, Virginia – Harold is very undersized for not only a DE but even for a OLB in a 3-4. Harold will either need to show he can add weight and still play or if he could play a stand-up LB in a 3-4. 1. Marcus Mariota, QB, Oregon – Mariota’s biggest question is his accuracy, so it will be interesting to see if he elects to throw at the Combine. 2. La’el Collins, OT, LSU – Collins is a mountain of a man who can run block with the best of them. But if he plays G or T in the pros will depend on his performance in pass protection drills. 3. Jaelen Strong, WR, Arizona State – Strong can make spectacular plays, but has also struggled with drops in the past. Watching him run the gauntlet drill will be fun. 4. Ameer Abdullah, RB, Nebraska – Abdullah really shined at the Senior Bowl, but will need to perform well in pass catching drills as his best position in the pros is likely as a change-of-pace 3rd down back. 5. Jordan Phillips, DT, Oklahoma – Phillips has all the measurables a team could want, but only 16 games of college tape. He must prove that his combination of size and speed can also play football. This week the biggest job interview in the lives of hundreds of college football players takes place in Indianapolis at the 2015 NFL Scouting Combine. 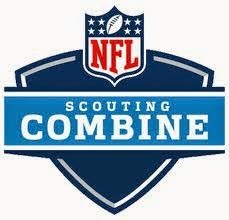 Players will be measured, tested, examined, interviewed and run through a variety of drills while scouts, coaches and GMs from every NFL team look on and evaluate. For most (like myself) the game film has been watched and the postseason games evaluated so that the Combine serves to confirm or deny an evaluation on a player. However, occasionally a guy will surprise in Indy, sending scouts scurrying for another look at the tape. In addition, much of the “action” happens out of view of the cameras, as interviews, drug test and medical exams can drastically influence a prospects stock without the public’s knowledge. So here is your program for all the action including a list of the invitees. The next post will focus on the schedule and biggest question marks. Let the Underwear Olympics begin!